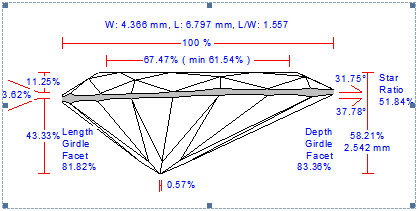 The new version Helium Polish 5.4 uses a more precise value of the Diamond Density, 3,51524 g/cm3. 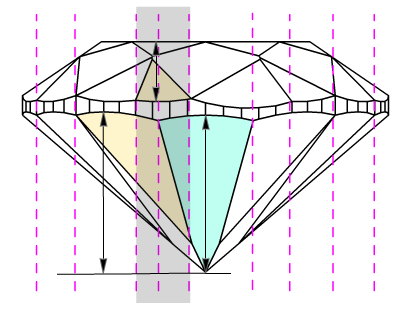 It leads to more precise calculation of the weights of polished diamonds. The Density value of 3,522 g/cm3 was used in the previous versions of the software. 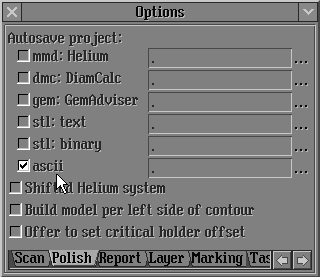 The new version of Helium Polish measures Pavilion and Girdle heights in models in a new way. 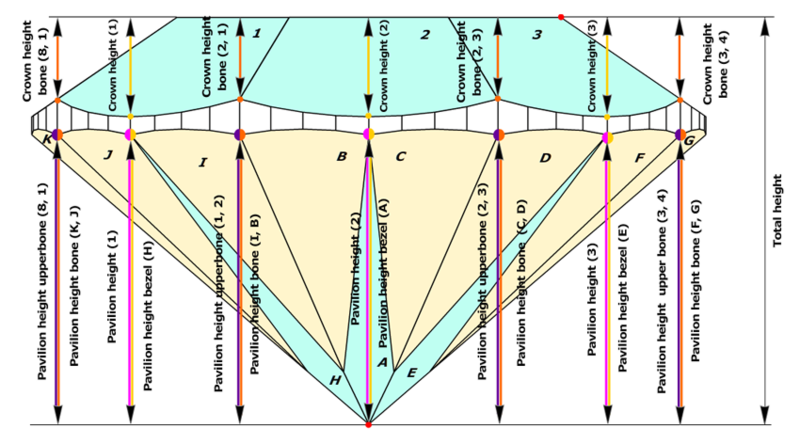 A detailed description of the old measurements of the Crown height, Pavilion depth, and Girdle height parameters can be found here. 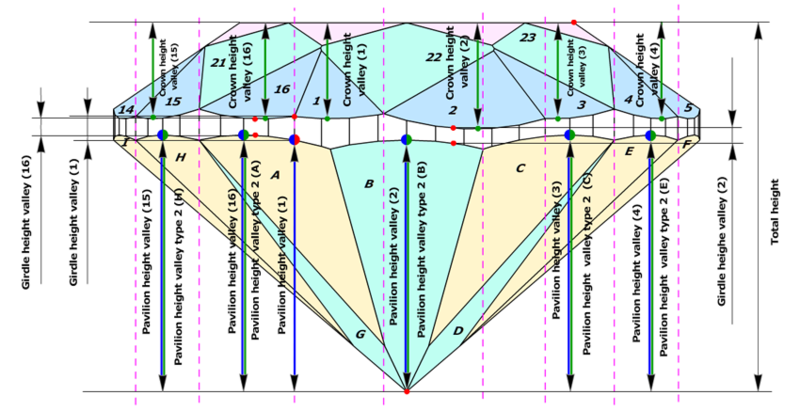 For cuttings with a big azimuthal difference between the Crown bezel point and the corresponding Pavilion bezel point, the sum of Crown height, Pavilion depth, and Girdle height is not equal to Total height. 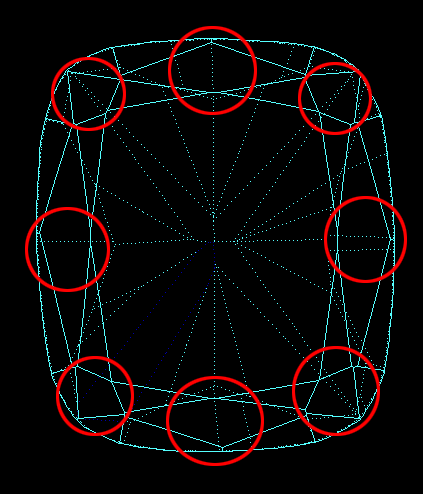 This always happens when the quantity of main crown facets is not equal to the quantity of main pavilion facets (Figure 1). - Two range of points that located on girdle lower curve and girdle upper curve. Every range has 720 points with step 0.5 degree by azimuth. - Crown bezel point and Pavilion bezel point. - Girdle points at local maximum of Girdle heights. 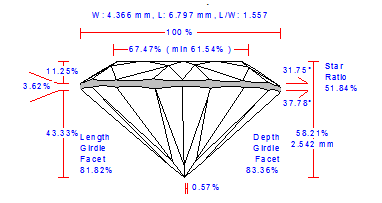 To get rid of this disparity, we have introduced a new method, according to which the Crown bezel points determine the measurement zones of the following parameters: Crown height, Pavilion height, and Girdle height bezel. 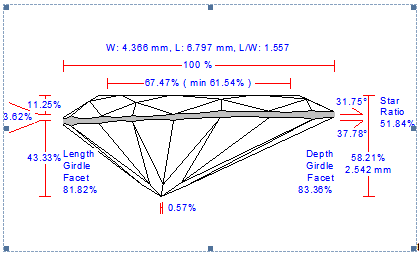 The software finds the Crown bezel point on the upper girdle curve, by the same method as in the previous versions. Then it finds the closest (by azimuth) Pavilion bezel point or the Pavilion bone point on the lower girdle curve, by the same method as in the previous versions. 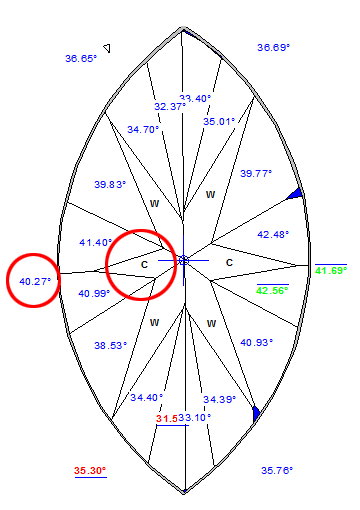 if there are no Pavilion bezel point or Pavilion bone point around Crown bezel point, it could be just a point on a lower girdle curve, with the same azimuth as Crown bezel point. Let us call it the Pavilion height point. 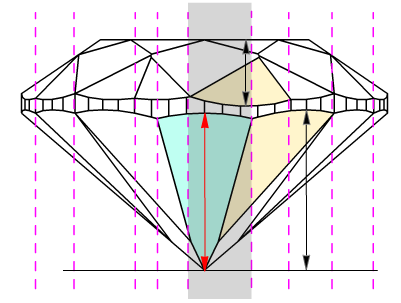 The distance, along diamond's axis that perpendicular to table, between maximal distant culet point and this Pavilion height point is called Pavilion height in the new version of the software (Figure2a, 2b). 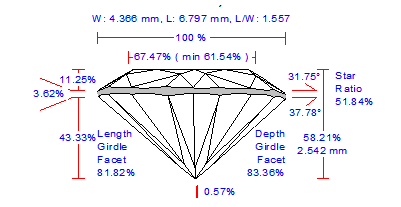 The difference between azimuths of Crown bezel point and Pavilion height point is determined. 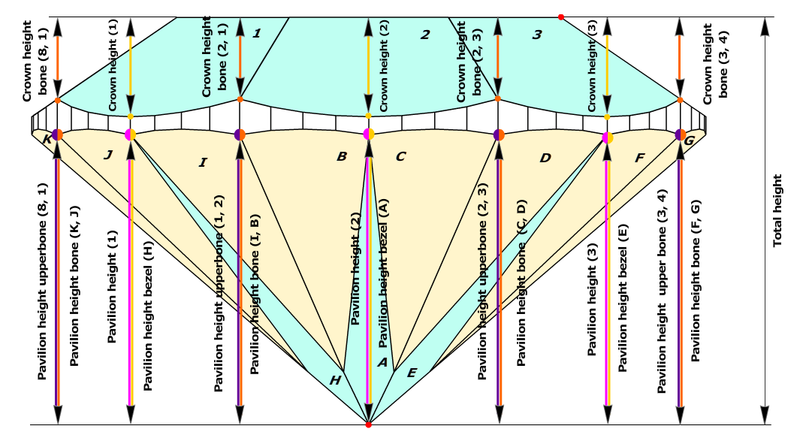 If the difference between the azimuths of the Crown bezel point and the Pavilion Height point is less then 4 degrees, the value of the Girdle height bezel parameter is measured as the height between the the Crown bezel point and the opposite Pavilion height point(Figure 2a and Figure 2a, enlarged view). - Crown bezel point and Pavilion height point. 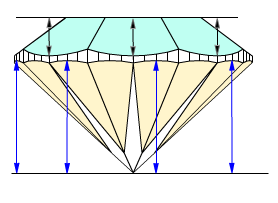 If the difference between the azimuths exceeds 4 degrees and less then 10 degrees, the value of the Girdle height bezel parameter is the local maximum among several values of the girdle height, which are measured between the Crown bezel point and the Pavilion height point with a step of 0.5 degrees by azimuth (Figure 2b and Figure 2b, enlarged view). 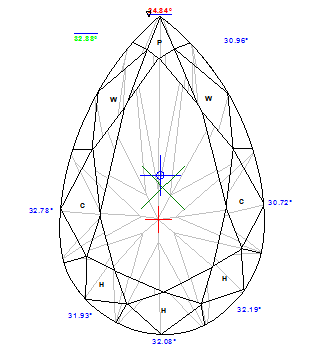 - Girdle points at local maximum of Girdle height on segment between Crown bezel point and Pavilion height point. The Crown bone points determine the measurement zones of the following parameters: Crown height bone, Pavilion height upperbone, and Girdle height bone. The software finds the Crown bone point on the upper girdle curve, by the same method as in old program. 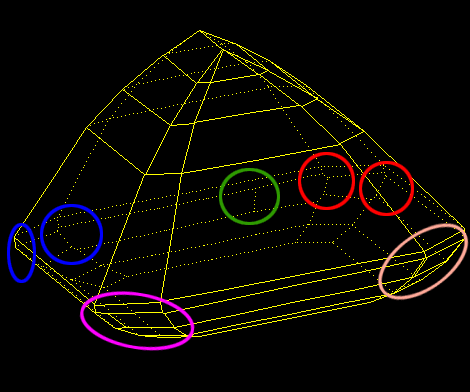 Then it finds the closest (by azimuth) Pavilion bone point or the Pavilion bezel point on the lower girdle curve, by the same method as in the previous versions. if there are no Pavilion bone point or Pavilion bezel point around Crown bone point, it could be just a point on a lower girdle curve, with the same azimuth as Crown bone point. Let us call it the Pavilion upperbone point. 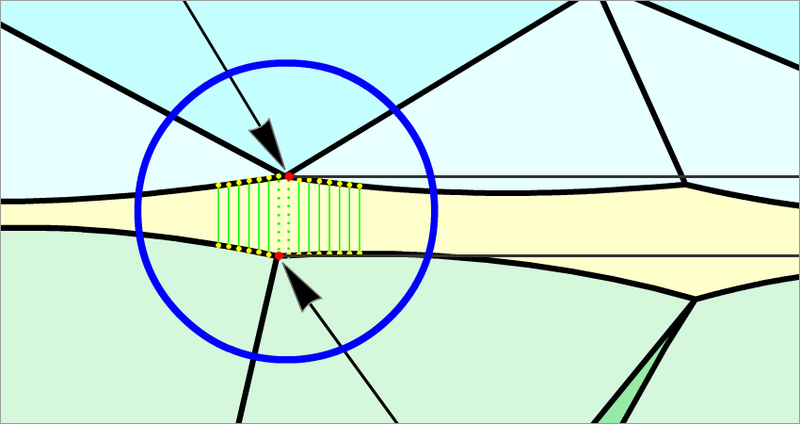 The distance, along diamond's axis that perpendicular to table, between maximal distant culet point and this Pavilion upperbone point is called Pavilion height upperbone in the new version of the software (Figure3a, 3b, 3c). The difference between azimuths of Crown bone point and Pavilion height point is determined. If the difference between the azimuths of the Crown bone point and the corresponding Pavilion upperbone point is less than 4 degrees, the value of the Girdle height bone parameter is measured as height between the Crown bone point and the opposite Pavilion upperbone point (Figure 3a and Figure 3a, enlarged view). - Crown bone point and Pavilion upperbone point. If the difference between the azimuths exceeds 4 degrees and less then 10 degrees, the value of the Girdle height bone parameter is the local maximum among several values of the girdle height, which are measured between the Crown bone point and the Pavilion upperbone point with a step of 0.5 degrees by azimuth (Figure 3b and Figure 3b, enlarged view). 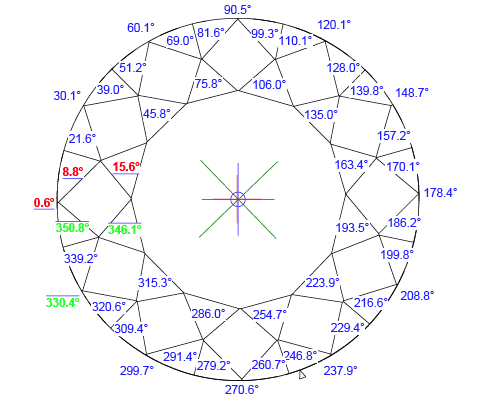 If differences between azimuths of Crown bone point and nearest Pavilion bone point or Pavilion bezel point are more then 10degree, the heights are measured at one azimuth. So, value of the Girdle height bone is equal to Girdle height with the same azimuth as Crown bone point. Also Pavilion upperbone point is taken at the point on girdle lower curve with same azimuth as Crown bone point (Figure 3c and Figure 3c, enlarged view). 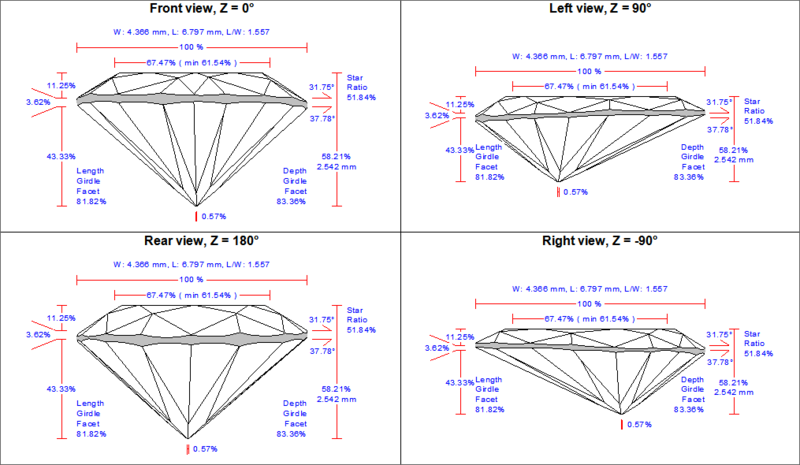 Consider our several complex examples of measurements of bezel and bone heights. 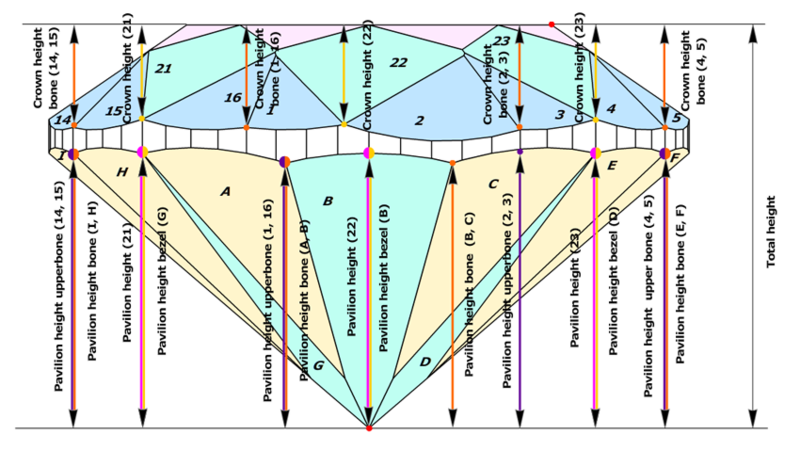 We use new way of estimating of heights for valley for Pavilion and Girdle. We developed two new methods: first method bases on measurements of Crown heights valley, second method bases on measurements of the old parameter Pavilion depths at girdle minimum. 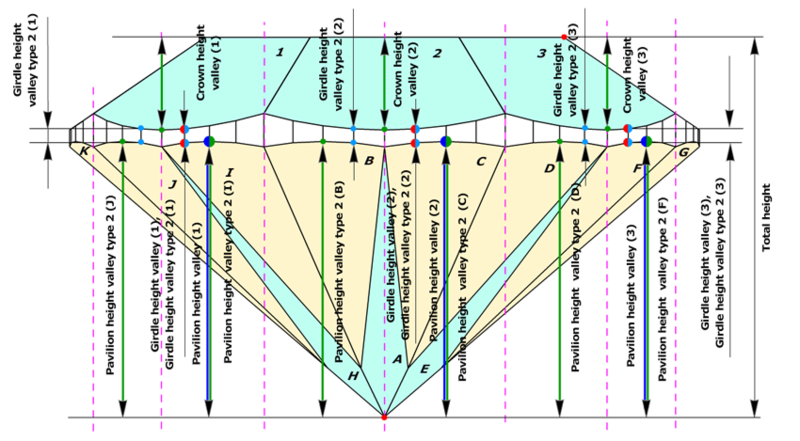 The reason for this changes is absence of some measurements for valley heights for semi-polished cuttings with absence of some halves or main facets. 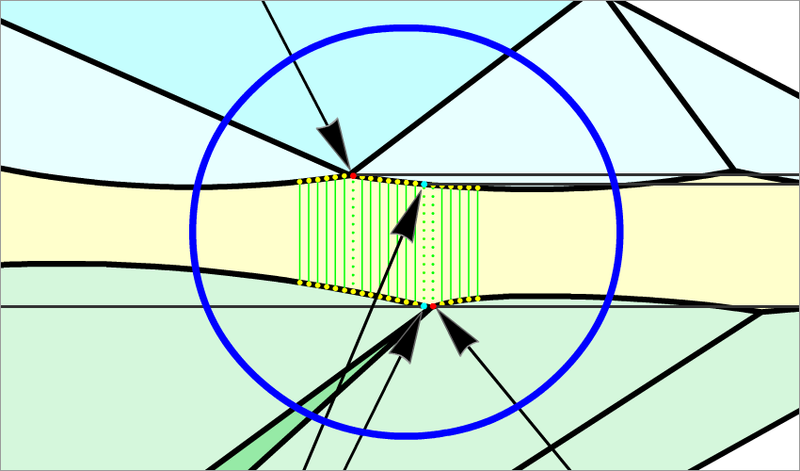 In fact, if upper and lower girdle facets are absent in cutting and model, main facets have longest width in place where it touches girdle and could be considered as zones for valley measurements (marked as yellow on the picture below). But these measurements of valleys heights were absent in previous program versions. Currently we use term wide-facets for zones of measurements of valley heights. Term wide-facet is a name of a facet on crown or pavilion that could be any type: main facets, upper, lower facets and any other, if it has a longest width in place where it touches girdle (marked as yellow on the picture below). Usually, upper and lower girdle facets are wide-facets. 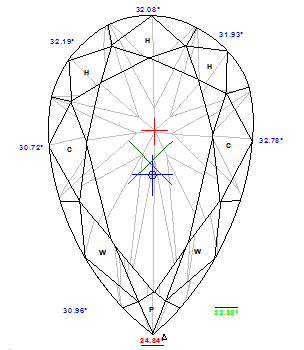 Main facets could be wide-facets in semi-polished diamonds, while upper and lower girdle facets are not made yet. 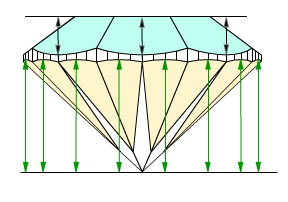 First method, type 1, is based on parameter Crown height valley. Crown height valley parameter can be measured on any wide-facet on crown. Crown height valley parameter defines measurement for Pavilion height valley and Girdle height valley parameters. As a result we have the same quantities of Crown height valleys, Pavilion height valleys and Girdle heights valleys, in spite of having different quantities of crown and pavilion facets. Second method, type 2, is based on Pavilion wide-facet maximum heights. The new parameter Pavilion height valley type 2 derives from the similar old parameter Pavilion depth at girdle minimum. 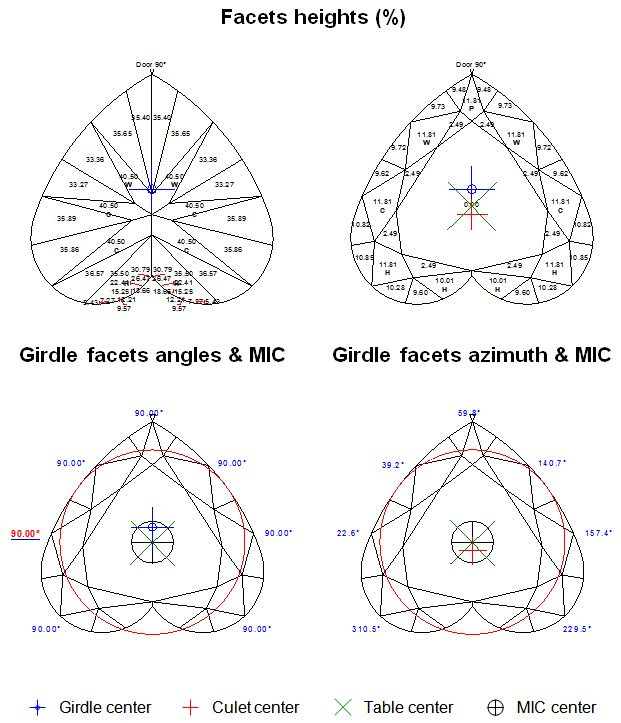 However, Pavilion depth at girdle minimum measured maximum height for lower girdle facets only, whereas new parameter Pavilion height valley type 2 measures maximum height for any wide-facet on pavilion (lower girdle facets, wide-facet main facets), as well. 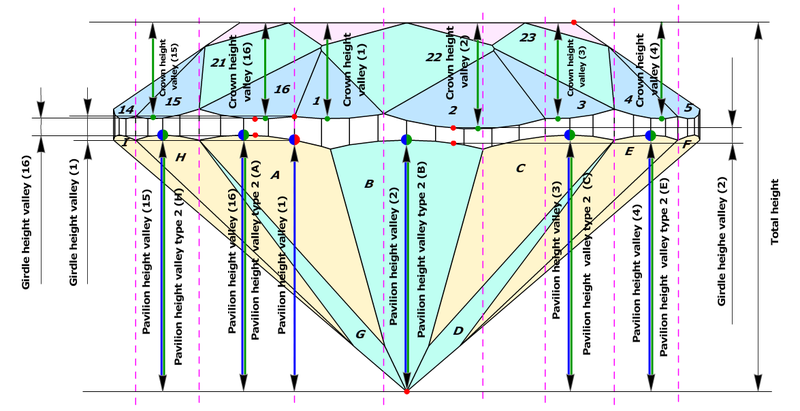 Pavilion height valley type 2 defines Girdle height valley type 2. 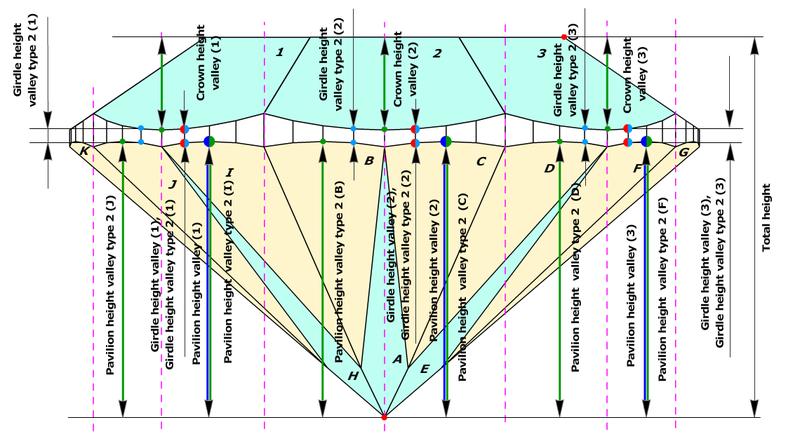 First method uses Crown height valley for definition Pavilion height valley and Girdle height valley parameters. It provides with the same quantities of Crown, Pavilion and Girdle height valley measurements. The wide-facets on crown are determined. On the picture, wide-facets, like upper girdle facets, marked as orange; wide-facets, like mains facets, marked as green. Maximum height is measured for each crown wide-facet. On the picture marked by arrows. That are Crown height valleys. The wide-facets on pavilion are determined. On the picture, wide-facets, like upper girdle facets, marked as orange; wide-facets, like mains facets, marked as green. Maximum height is measured for each pavilion wide-facet. On the picture marked by arrows. 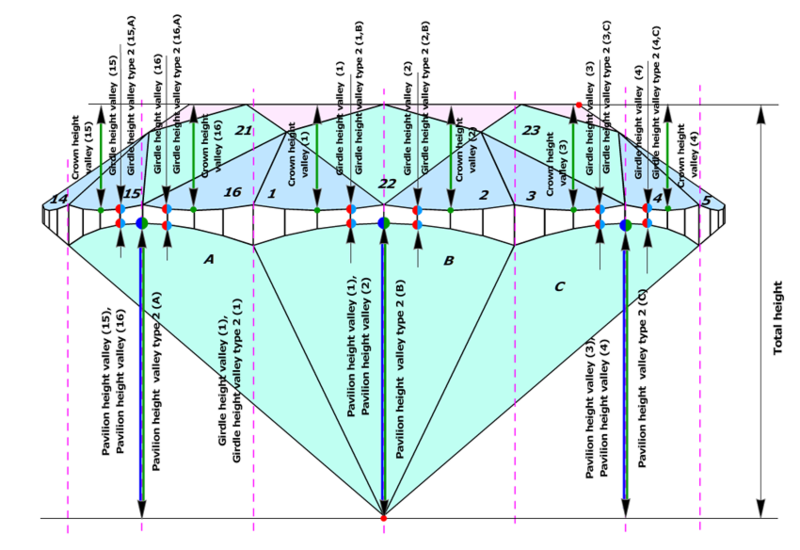 The zones for pavilion and girdle valley’s measurements are located in the place of intersections of crown wide-facets and opposite pavilion wide-facets. On the picture, wide-facets, like upper girdle facets, marked as orange; wide-facets, like mains facets, marked as green. 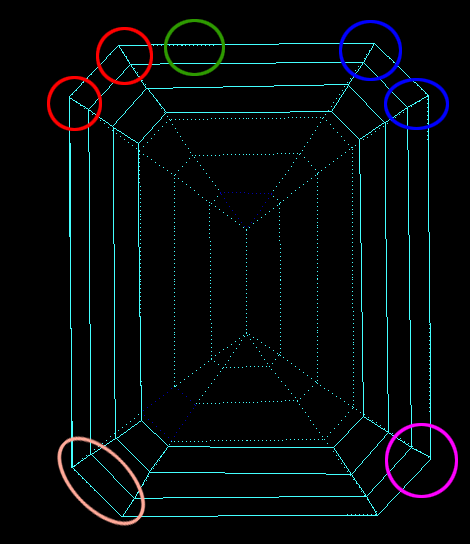 Borders of facets intersections marked by magenta's dashed lines. If there are several pavilion facets opposite the crown wide-facet, the zone for future Pavilion height valley and Girdle height valley measurements is that intersection where pavilion’s wide-facet contains its facet maximum height (marked by red arrow). On the picture the zone for future Pavilion height valley and Girdle height valley marked by gray transparent box. 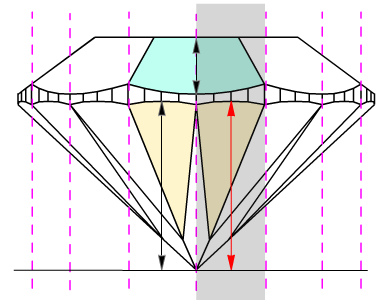 If there are two pavilion wide-facets opposite crown wide-facet, and if every of these pavilion wide-facets contain its facet maximum height, the only one maximum (marked by red arrow) will be taken into account and defines a zone (marked by gray transparent box) for future Pavilion height valley and Girdle height valley measurements. In case of no one maximum of pavilion, the zone for future Pavilion height valley and Girdle height valley measurements will be just full area of crown wide-facet. Program checks presence of Pavilion wide-facet maximum heights inside zone and considers it as parameters Pavilion height valleys for every zone. The difference of azimuths between Crown height valley and Pavilion wide-facet maximum heights is determined for every zone. If deference is less then 1 degree, the Girdle height valley will be measured as girdle height between Crown height valley point and Pavilion wide-facet maximum height point. If deference is more then 1 degree, the Girdle height valley will be measured in place where girdle height is minimal between their azimuths. If there are no one Pavilion wide-facet maximum height inside the zone, the Girdle height valley will be the minimal girdle height on zone interval and the Pavilion height in place with the same azimuth as Girdle height valley considers as Pavilion height valley. 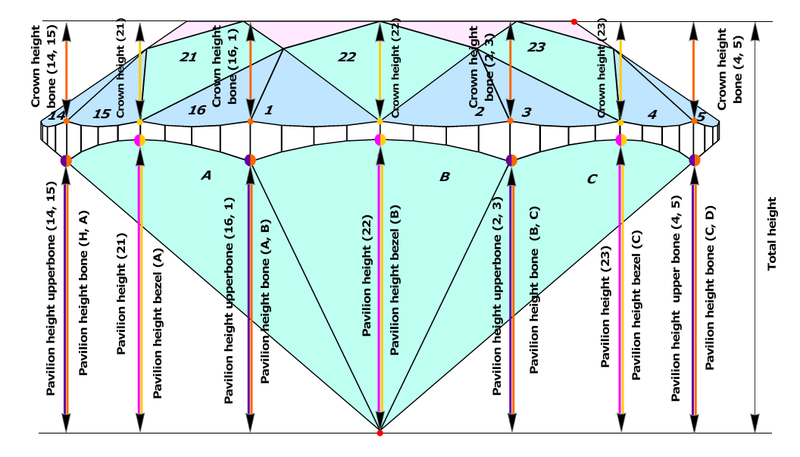 Second method uses Pavilion wide-facet maximum heights for definition Pavilion height valley type 2 and Girdle height valley type 2parameters. 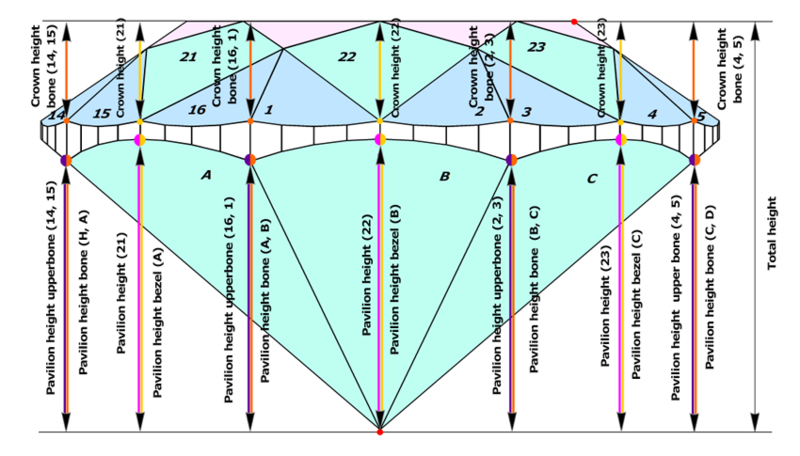 The measurement for parameter Pavilion height valley type 2 (black arrows on the picture) are the same as Pavilion wide-facet maximum heights that described above (see description for Fist method, type 1, section 2). Moreover, Pavilion height valley type 2 is similar to old parameter Pavilion depth at girdle minimum. 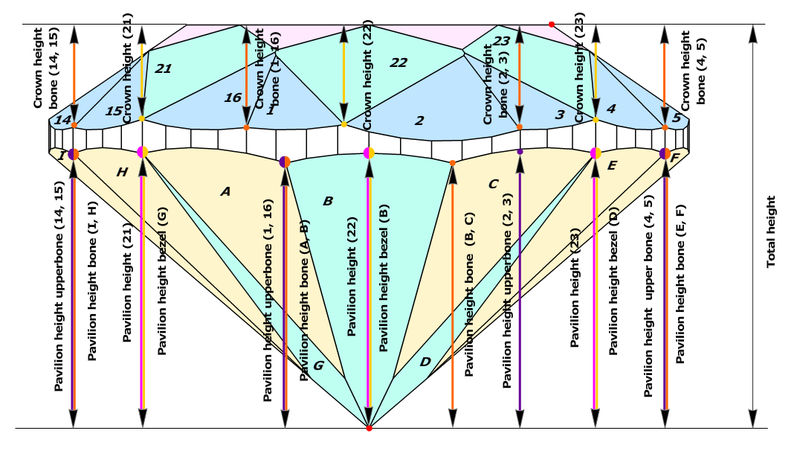 However, Pavilion depth at girdle minimum measures heights for lower girdle facets only, new parameter Pavilion height valley type 2 measures maximum heights for all wide-facets on pavilion. The difference between Pavilion heights valley and Pavilion height valley type 2 are shown on the picture below. Left picture illustrates measurements of Pavilion heights valley, by first method (blue arrows), and right picture illustrates measurements of Pavilion heights valley type 2, by second method (green arrows). Crown height valley are shown by black arrows. We introduced parameter Pavilion height valley type 2 not to lose measurements are shown on the right picture. Consider our several complex examples of measurements of valley heights for more details. 1) The method of accounting of naturals and extra facets remains unchanged and is not affected by the new method for measuring the crown, pavilion, and girdle heights. 2) Pavilion depth is renamed to the Pavilion height bezel parameter. Total depth is renamed to the Total height parameter. We created new version of Full report that united together full report for polished and semi-polished diamonds. It has the same name like old Full reports for polished diamond, Full report for brilliant or Full report for rounded fancies. Since new version of Full report contains all data from old report for semi-polished, the old Full report templates for semi-polished were removed from template set. 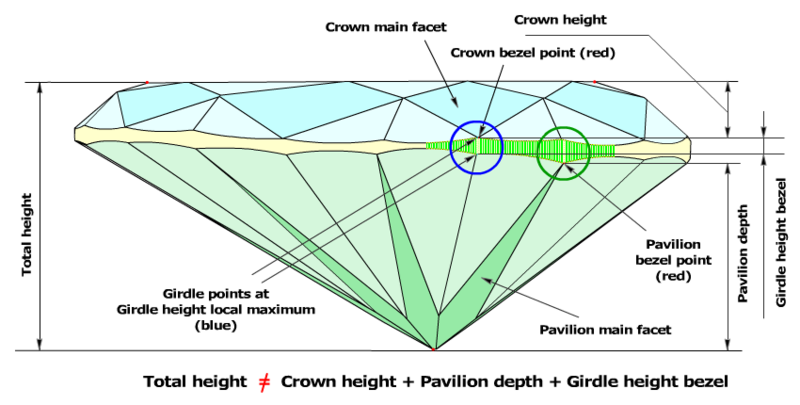 Reports for cuttings that contain 10, 12 or more main facets, like Solasphera, are improved. For example, all values of 12 main facets, as well as values of all upper and lower facets, are output into the pictures of angles, azimuths and heights in the new version, whereas values for 8 main facets only were output in the previous versions. 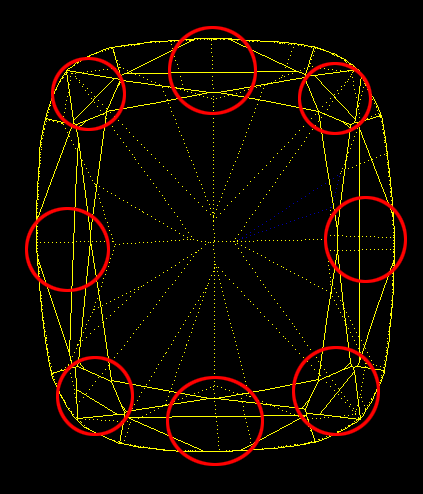 The statistic values of parameters take into account all 12 main facets, not only facets that restricted by quantity 8. To add more picture add more sections [Picture..] into INI file. See the example below for adding three more picture with rotation about the vertical axis 90, 180 and -90 degrees. To rotate a picture about the vertical axis, set the rotation angle in degrees as the value of Z in the [Picture..] section. To scale the font size, set the scaling factor in percent as the value of FontSize in the [Picture..] section. The AutoAspectRatio parameter provides the same proportions X by Y for all the views of the picture Profile View Report. 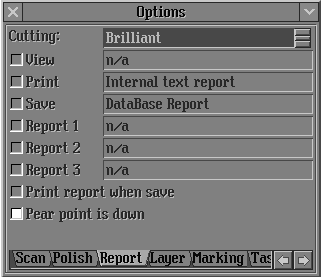 Overwise, AutoAspectRatio=0, and no equal proportions are seen in the report window. Below you can see some pictures with the Front and Rear views looking larger than the Right and Left views. Extra parameters, AspectRatioX and AspectRationY, provide custom proportions for the pictures. 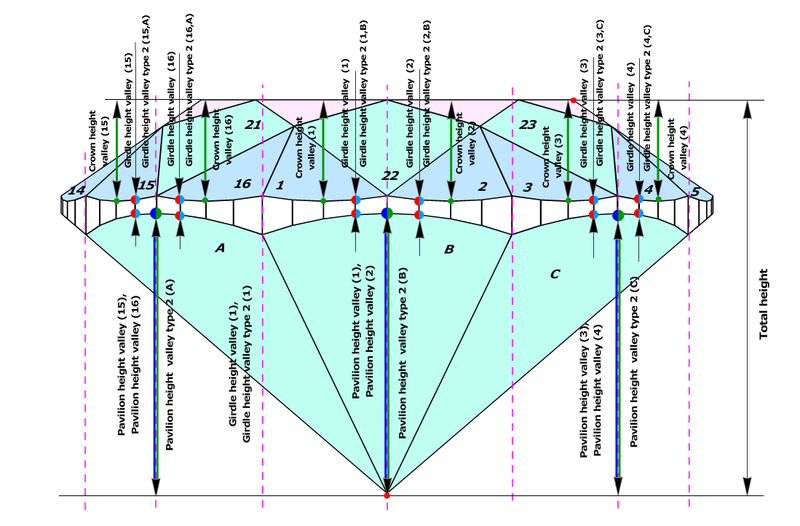 To change the line thickness, set the NormalLineThickness and BoldLineThickness parameters in the [Picture..] section. More details about these parameters. This new option allows customizing pictures of Pear cutting in reports. The pear point could be either Down or Up. Note. The status of the Pear is point down checkbox is saved in the Windows Registry. To save the status, run the software, check or uncheck the checkbox, and exit the program. Next time you run it, the status of the checkbox will be exactly the same as you set. 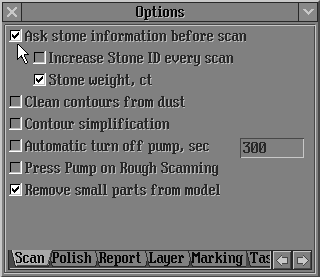 Information on the quality of the model and errors of building is available on the screen in the Model tab of the right section of the Scan polished diamond panel as well as in reports, in the Model building info table. There are three types of the errors: big, medium, and small. 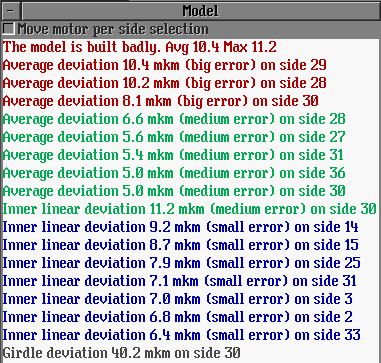 First 8 maximal values for each error type are listed on the screen and in reports. 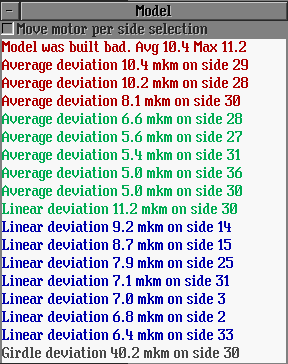 Average deviation/error - The average value of the distance between the contour and the projection of the model for the given facet. 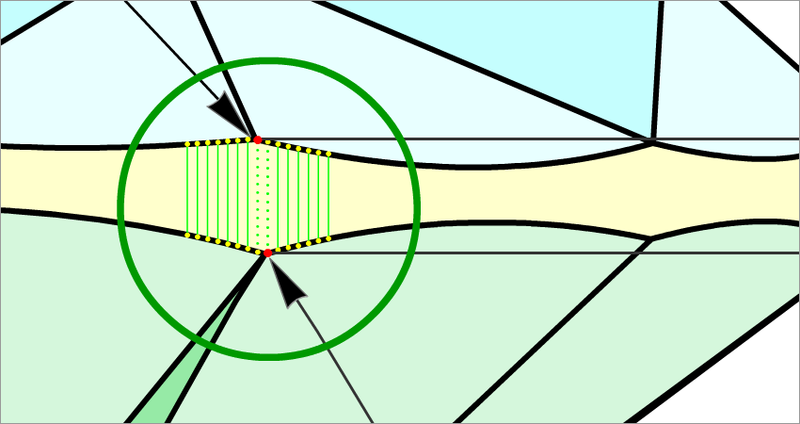 Inner linear deviation/error – The distance between the most distant point of the contour inside the projection of the model and the point of the projection for the given facet. 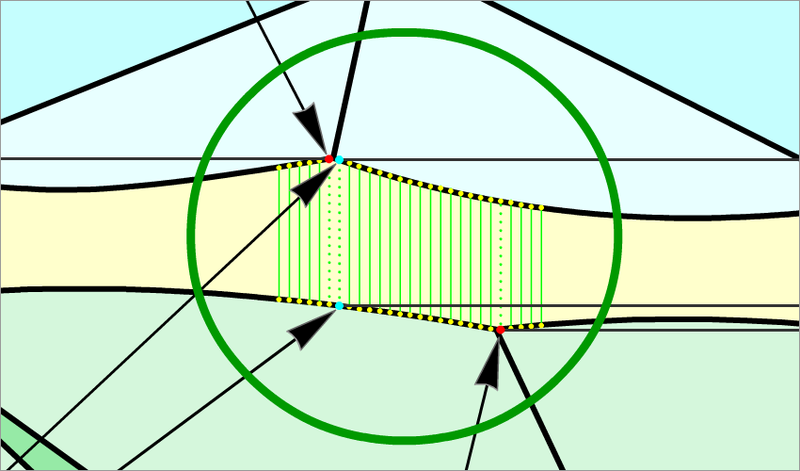 Girdle deviation/error - The distance between the most distant point of the contour outside the projection of the model and the point of the projection for the given girdle facet. This parameter warns about possible presence of dust on the girdle. 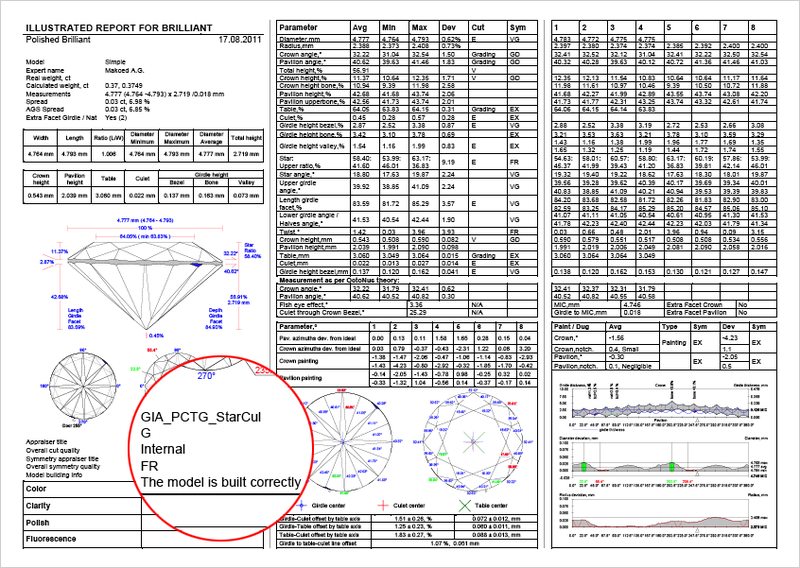 The information on error types is displayed in the Scan polished diamond panel of the Model tab: big error, medium error and small error. There is full information on model building in Full reports, in the Model building info section. The general Model building info is available in Illustrated reports. The new version of the software allows automatically saving an ASCII file while building the cut. 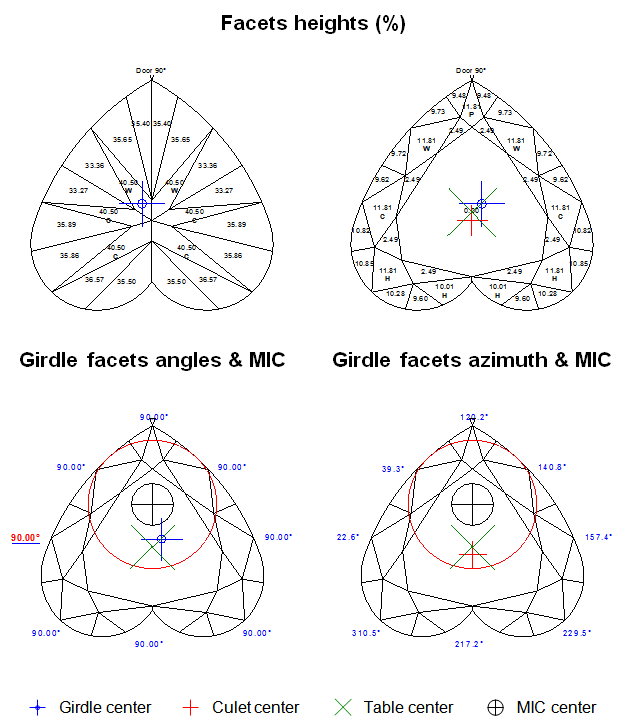 Facet definition and marking are improved in some models of round fancies. The girdle center of a Heart cutting was defined wrong in the previous versions. This bug is fixed. Below you can find a sample report for the ideal Heart cut created in previous version 5.2 The girdle center marked by the blue cross is not in the center. 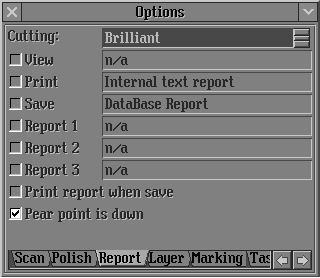 The same report created in new version 5.4 is shown below. The girdle center marked by the blue cross is located correctly. Two more dimensions are added for the table: Table by width and Table by length. Table by width – the dimension of the Table along the direction of the Width. Table by length – the dimension of the Table along the direction of the Length. The new parameters are available for Rounded and Square fancies. Usually, Table by width is equal to the Table min for fancy cuttings, such as Marquise, Oval, and Pear. 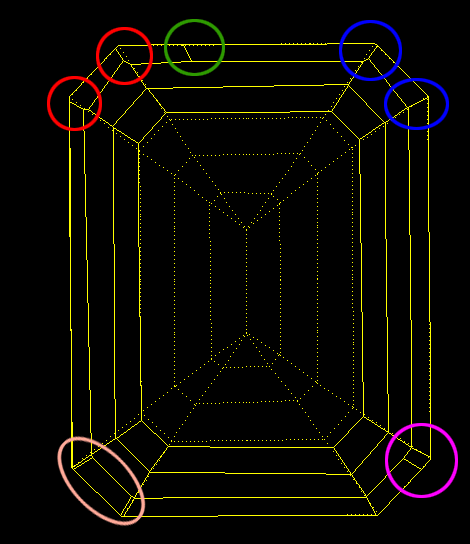 The Table min value is shown below, in a picture of Main view of the diamond.